Despite three full series and a succession of specials with the Tenth Doctor on screen, there remained a few notable omissions in the rogues gallery of that tenure. While ‘The Day of the Doctor’ saw the returning Tenth Doctor cross paths with the Zygons and tales in other spin-off media have seen him meet other recurring foes not encountered on television, ‘Cold Vengeance’ finally gives David Tennant the chance to act alongside the dangerous and iconic Ice Warriors in their own fiftieth anniversary year. The Ice Warriors, of course, hearken back to the Second Doctor era and its prolific base under siege stories, and it’s fitting to see ‘Cold Vengeance’ follow in this path on a colony world’s freezer satellite that finds itself the unknowing victim of corporate oversight and the bottom line. Over fifty years, of course, the Ice Warriors’ culture has developed- mostly off screen and through narrated accounts- into one based upon honour, and vengeance due to past misdeeds in a ten-year war between humans and Ice Warriors expertly taps into the most basic notion of retaining and restoring honour. Perhaps because of the shorter running time of modern episodes, however, there isn’t too much room for actual development of the foes, a fact that becomes all the more glaring as it becomes clear that Lord Hasskor is labouring under an impression that is not completely factual. Thus, while the Ice Warriors are written as a suitably powerful foe and Nicholas Briggs does superb work in imbuing both a subtle and overt sense of menace as required, it is a bit jarring to see a member of such an honourable race who is so single-minded in his intent to avenge that even after learning the truth he would still go to any length necessary just to see his enemy lose to some extent even if he himself cannot win. Indeed, describing him as a being quite literally being held together by a desire for revenge seemingly rewrites a component of the Ice Warrior moral code that certainly shows just how far away from their time in the Federation they still are at this time. Given how supportive of humanity the Doctor remains, it’s always oddly refreshing to see humans portrayed in a light that is anything less than flattering, and ‘Cold Vengeance’ certainly does not shy away from using humans to enhance the sense of sympathy felt for the Ice Warriors. Fortunately, however, the humans are not written as complete monsters, and the current state of both races- while anything but ideal- does at least offer a glimmer of hope for redemption for the humans and of hope for survival for the Ice Warriors. ‘Cold Vengeance’ on many occasions speaks of the importance of memory, whether it be of faceless events of the far past or of a singular fallen loved one more recently, and this blending of the past and present is a strong driving force that carries the narrative from beginning to end. David Tennant and Billie Piper again excel with the reprisals of their iconic roles, and their energy along with the script, direction, and sound design perfectly recapture the essence of what makes their time together so beloved. 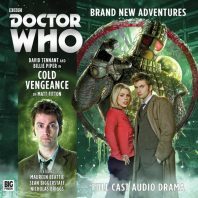 With Rose at her most resourceful and the Doctor at his most determined, ‘Cold Vengeance’ again slots in perfectly with the 2006 dynamic for which this set has aimed. And so while there is unquestionably a questionable action where an alternative course of action could have resulted in much greater nuance and development for the story’s foe, this tale more than sufficiently fills the remit of a lost story and provides a satisfying encounter between the Tenth Doctor and the Ice Warriors that was woefully overdue.